The view from John Dowson’s living room window is a miniature masterpiece. 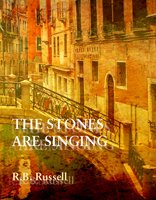 It reveals Venice in decay; crumbling, soft pink brick, and the ever-changing jade waters of a minor canal. But one morning the composition is marred by an old jacket draped carelessly over the iron railings of the balcony. This almost insignificant alteration to the perfect, arranged order of Dowson’s life is just the first of many changes which become more profound as the days pass. The Stones are Singing suggests that even the smallest of changes in our world can hint at parallel existences, and the ability, for some, to move between alternative realities. Available from PS Publishing as an unsigned jacketed hardcover [£15], and a signed and numbered edition limited to 100 copies [£25]. Recommended Halloween reading in The Washington Post. Russell interviewed at Weird Fiction Review.